NGI Education and Outreach Program supports the NOAA Phytoplankton Monitoring Network with training sessions like the one shown here. Participating in NGI sponsored contests such as the Student Poster Contest and Student Photo/Video Contests held in conjunction with the annual NGI conferences. 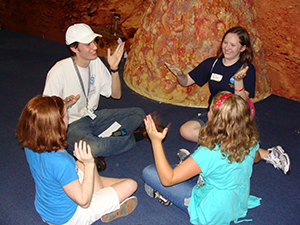 In addition, NOAA and NGI currently conduct three internship programs. Mississippi State University and the Northern Gulf Institute host outstanding interns at the John C. Stennis Space Center, MS under two of those internship programs. The third and largest internship program is the NOAA NGI Diversity Internship Program, which is administered by NGI partner Dauphin Island Sea Lab. Students are selected based on their interests and availability to work in various research centers or field laboratories in the northern Gulf. They are teamed with a mentor who assigns them work that is relevant to the NGI mission and NOAA workforce development. The NGI Education and Outreach Program is based at the NGI Program Office. Program team members are located at all five of the NGI member institutions. Most NGI outreach materials are available online via the NGI website. Printed NGI program materials are developed annually. NGI also develops informational brochures on key topical issues. To submit an NGI news story or events of interest, or if you have inquires about Education and Outreach programs and student opportunities, please email us. You can also follow us on Facebook and Twitter. Hoping you like all things NGI!